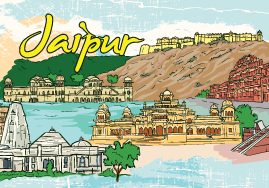 Today we have a guest post by Himanshu, a seasoned traveller from India who is talking about some of the wonderful place in Jaipur, India to explore with children. 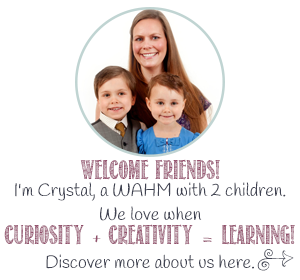 The capital city of Rajasthan, Jaipur is an amazing place to visit with kids. There are lots of fun activities and adventurous things to do that will leave a deep fondness of the place. Jaipur is famous for its colourful street markets and vibrant culture. Besides being a revered tourist destination, it is also an exciting location for children to enjoy as much as adults. 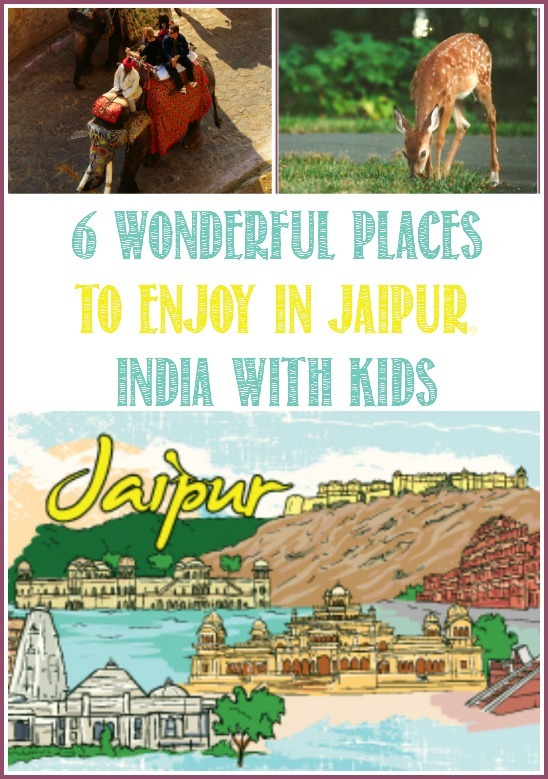 Enlisted below are 6 incredible places for children to enjoy in Jaipur. 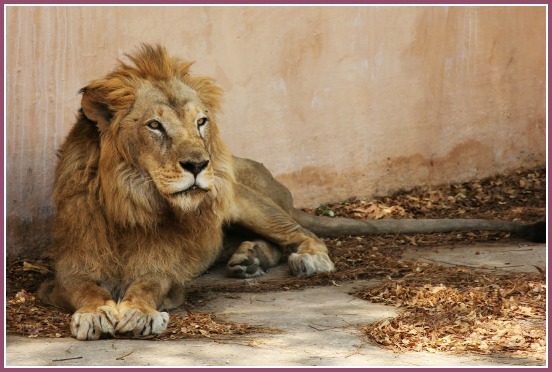 A number of animals and birds are sheltered in the famous zoo of Jaipur. Learning about animals is an important part of a child’s early years and Jaipur zoo is a fine example for practical knowledge. Established in the year 1877, the Jaipur zoo houses over 50 species of wild animals, amongst which the Royal Bengal Tiger, Black Panther, Cheetal Deer and Peacocks are popular attractions. Children especially love the nature-identical enclosures within which these animals are kept. A walk through the zoo takes 2 to 3 hours and refreshments are available inside the zoo as well. Central Park in Jaipur is arguably the largest park constructed in the city. 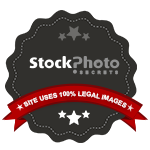 The park is situated at the epicenter of Jaipur and is maintained by Jaipur Development Authority. The park is laden with greenery and soft grass. There are jogging tracks all round the park for refreshing early morning runs as well. The most popular attractions however are the large stone statues that are placed in the park vicinity. Some of these statues are more than 15 feet tall and are placed erect in the shape of human silhouettes. Jaipur Deer Park is a safe haven for several species of deer. The entire park is fenced on the periphery and walking paths are constructed for visitors to view these magnificent beasts in their habitat. Children have a great time here as it houses more than seventy adult Chinkara Deer that are clearly visible throughout the park premises. 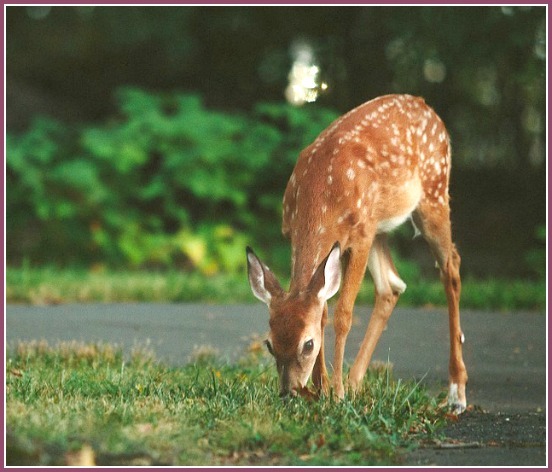 Some deer even eat from the hands of visitors, making it a unique bonding experience for children with nature. The fences are safe as they are built up to 12 feet high so that no accidents happen, making it safe for children. Jawahar Circle Park is a great place for spending leisure time with family. Children specially enjoy the green grass and playing in the open fields. There is a musical fountain situated inside the park that is operational during the evening. It is a treat to watch the water in the fountain dance to the music played in the backdrop. Children can also indulge in enjoying swings and slides that are installed in the park. Overall, Jawahar Circle Park is a fine example of architectural ingenuity and aesthetic appeal. Amber fort is one of the most famous forts in the state. The walls exhibit deep roots in history and heritage. There are several attractions inside the fort but the most exciting part of visiting amber fort is the elephant ride. 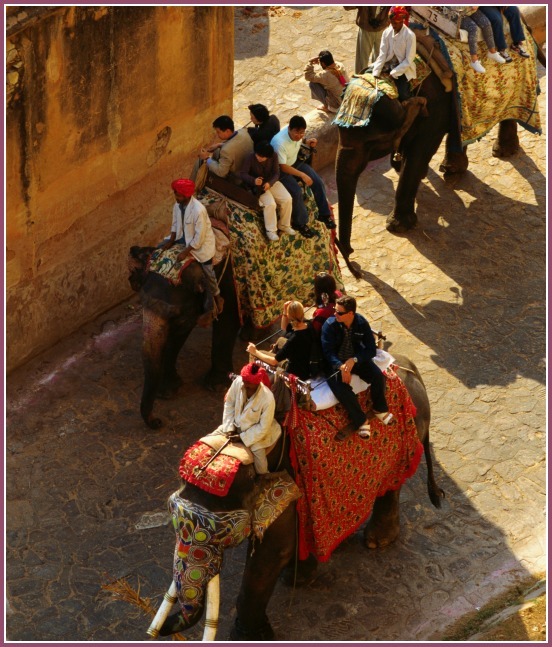 For a nominal fee, elephant mahouts offer a ride to tourists through the pathway till the gate of Amber fort. Children enjoy these rides the most as it offers thrill and adventure. The elephants are decorated and painted in traditional patterns, adding extra appeal to their magnificence. Jal Dhara is a man made fountain that is designed to represent a naturalistic feel. The fountain is around 40 feet high and follows a long trail of nearly half a kilometer of manmade channels. There are several statues and sculptures of wild animals in the vicinity that children find very exciting. The pathways are constructed around lush green environments, providing a relaxing effect on tourists. There are bridges, pools and artificial fountains throughout the area that leave children and parents absolutely awestruck. Jaipur is filled to the brim with extravagance. The aura that this city emits draws everyone back towards it. It is a wonderful destination for children to learn about nature and culture while having a great time in the process. Himanshu is a fun-filled traveller who likes to find new places perfect for calm and peaceful hang out. He frequently blogs at PearlsIndiaTour.com & TourToIndia.com and shares his travel stories with equally passionate travelers.